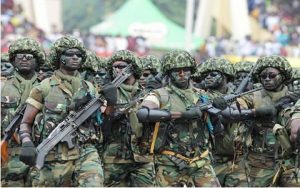 Recruitment: Nigerian army announce date for screening – Royal Times of Nigeria. The Nigerian Army, through the Chief of Administration, Major-General I. M. Alkali, has announced its zonal screening for the 76th regular recruitment intake for trades/non-trades men and women. The screening originally scheduled to hold from January 22 to February 3, 2017, has been proposed to take place between May 27 and June 9, 2017. Successful candidates will immediately begin training at the Depot Nigerian Army in Zaria. Alkali in the statement said; “The Nigerian Army wishes to announce to the general public that 76 Regular Recruits Intake Zonal Screening Exercise earlier postponed will now hold from 27 May- 9 June 2017. “Note that candidates selected after the zonal screening exercise will commence training immediately at Depot Nigerian Army, Zaria,”.